Stigmata - the spontaneous appearance of bodily marks in locations corresponding to the crucifixion wounds of Jesus Christ - have long been a controversial phenomenon. Former well-known stigmatics, such as Saint Francis of Assisi, Anne Catherine Emmerich and Therese Neumann, have mostly been associated with the Catholic Church. Judith von Halle however, who received the stigmata at Passiontide in 2004, is a member of the Anthroposophical Society, and has to date published a dozen notable volumes of spiritual-scientific research. 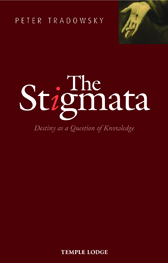 In this small book, based on decades spent studying anthroposophy, Peter Tradowsky attempts a comprehensive, if aphoristic account of the stigmata. He focuses in particular on Judith von Halle, responding to Sergei O. Prokofieff's recent publication The Mystery of the Resurrection, in which the latter approaches stigmatization from a particular perspective.